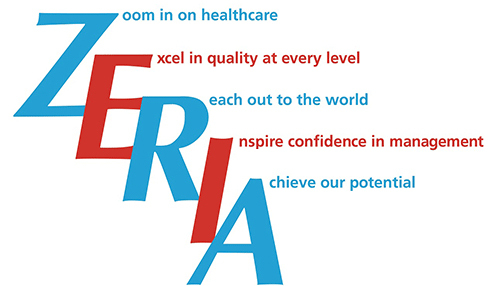 Corporate Philosophy | Corporate Profile | Zeria Pharmaceutical Co., Ltd.
we call the Z・E・R・I・A　Five Corporate Spirits. As a comprehensive healthcare company, Zeria is committed to the development of pharmaceutical products that contribute to the health of people around the world. Guided by the fundamental idea that "Making health is making happiness," we strive to ensure that each of our products improves human health and quality of life. Zeria's fundamental priority as a comprehensive healthcare company is the protection of life. We follow strict ethical standards and work to achieve the highest quality in all of our products. Zeria's corporate vitality depends on the maintenance of a broad global perspective and on continued innovation in everything that we do, including research, development, and marketing. We are committed to maintaining the trust of our customers and stakeholders, and we work to continuously bolster our growth potential on a base of sound management practices. Zeria believes that people are the foundation of its success and that a sense of duty, pride, and enthusiasm is the cornerstone of true job satisfaction. Accordingly, we are committed to the ongoing professional development of all of our employees.